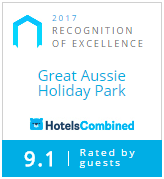 We welcome day visitors who are visiting guests of Great Aussie Holiday Park. Enjoy all of the activities and adventures at Great Aussie Holiday Park. Please read day visitor information carefully prior to arriving. Day visitors must call into reception to obtain a vehicle pass and gate access code. Day visitor fee is $10/person or $30 family (2 adults/3 children). Additional persons are $5/infants (under 2 years) and seniors are no charge. Day visitors must sign a waiver form to be able to use the park facilities and activities the same as guests that are staying at the park. There is no parking permitted along our road into the park. There is 5 minute only parking at the turning circle before the boom gates. Day visitors cannot bring boats or pets. Day visitors must depart the park by 10pm unless prior arrangements have been made with the park and staff. There is allocated parking in the park for day visitor vehicles.